T-Mobile’s newly announced Personal CellSpot at-home router is now available to Simple Choice customers who want to have a a “personal T-Mobile tower” in their house. 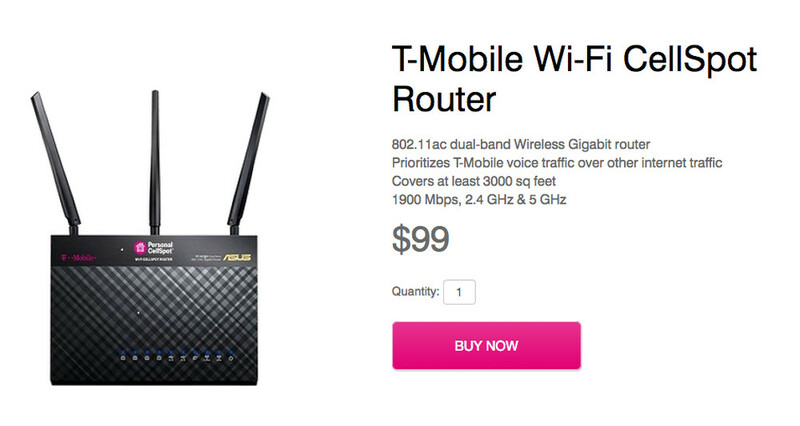 The device, like any router, is used to help boost a signal, only this router helps give you full T-Mobile service when you may lack it. According to T-Mobile, 57% of American wireless users say they “often” drop calls when at home. The Personal CellSpot is here to fix that. The Personal CellSpot is listed on T-Mo’s site for $99, but the company is letting Simple Choice customers with a broadband connection and a WiFi calling ready phone, get one for free with a $25 deposit. Oh, the CellSpot can also replace your existing router or team up with it. To order a Personal CellSpot, stop by a T-Mobile store or call customer care. On a semi-Uncarrier-related note, T-Mobile’s new Gogo in-flight texting service is now live as well. When on a flight with Gogo in-flight WiFi, customers can send and receive unlimited text and picture messages, along with visual voicemail for free.